Physical Activities for Young People With Severe Disabilities will help you provide high-quality physical education for students with cerebral palsy, spina bifida, and other orthopedic impairments that inhibit their ability to function physically. Sotcover, 136 pages. • 50 illustrated activities that use common objects as equipment. 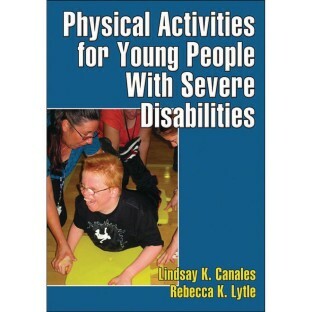 • Evidence-based research that outlines the benefits of physical activity for people with disabilities and that you can use to support your adapted program. • Safety tips and teaching strategies for working with students with disabilities. The activities are easy to set up and conduct in a variety of environments, from the gym to the classroom to the outdoors. Each activity features high and low variations to guide you in adapting it for students with a wide range of abilities. And you can use the informal assessment questions included with each activity to gain immediate feedback about its effectiveness for the students. Activities are organized by the primary area of skill or fitness they address: balance and flexibility, muscular strength and cardiorespiratory endurance, coordination, and moving in space. This makes it easy for you to find suitable activities based on your students' needs, abilities, and individualized education programs (IEPs). In addition, each activity notes secondary skills that it addresses. Regardless of their impairments, students benefit from physical activity. Physical Activities for Young People With Severe Disabilities provides the ready-to-use information you need to help them receive those benefits.